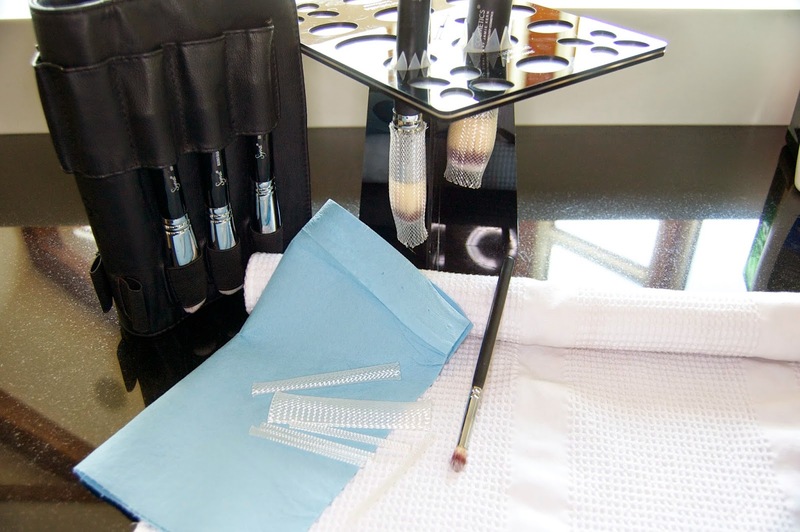 Caring for your brushes- the breakdown. Taking good care of your brushes is important no matter how much or how little you've spent on them. Here's my guide to giving your brushes a little TLC. These are products you should use on your brushes after every use, this is especially important if you suffer from skin problems because your brushes can harbor bacteria that you later put back on your face. Typically they work best by spraying them onto your brushes and then wiping off any grime on a tissue (car shop towel works well for this because it has minimal lint), by the time you need to use them again they're clean and dry! For stubborn product removal like gel liner or concealers, sometimes it works best to dip the brush into a small amount of the product for a few seconds and then wipe the makeup off. 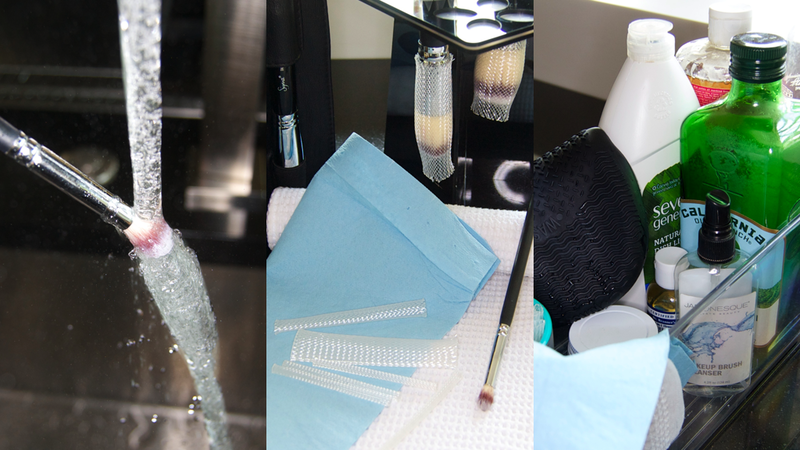 This gives the brush cleaner a little extra time to break down the makeup. Ensure you don't use too much cleaning fluid for this, you just need enough so the brush hairs are covered, it shouldn't come above the ferrule as this can, in time, damage the adhesive holding your brush together. 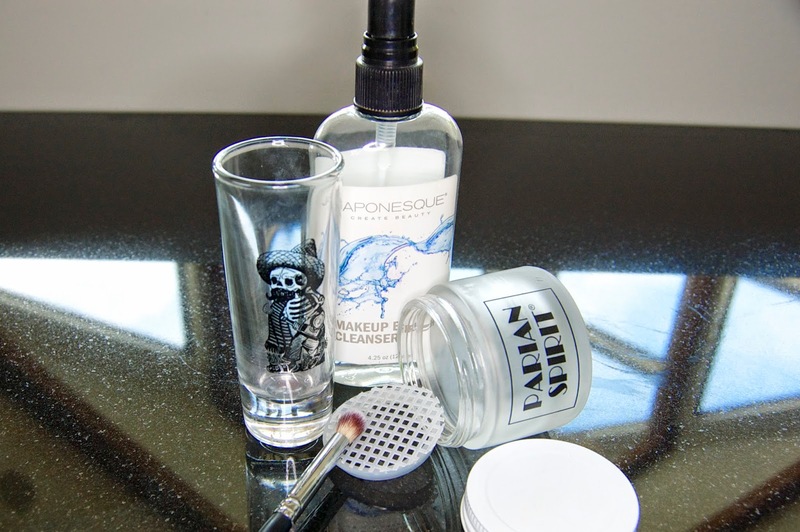 If you do need something to dip your brushes into i recommend using a shot glass or the Parian Spirit Jar that comes in their brush cleaning kit, it comes with a mesh insert in the bottom of the jar to rub the brush hairs against for a more intense clean. Although your brushes shouldn't end up too damp either way, i always like to dry them with the hairs pointing down. Whether you're a seasoned brush collector or have just bought your first set of brushes, its always important to give them a deep clean. I like to do this once a week, not only to remove any build-up the spot cleansers might've left behind but also to condition the brushes. Olive oil & dish soap- The dish soap will take care of any bacteria and grime and the olive oil will not only condition your brushes but help to lift out any oil-based products so the dish soap can wash it all away (think: oil cleansers for oily skin... i promise it makes sense). 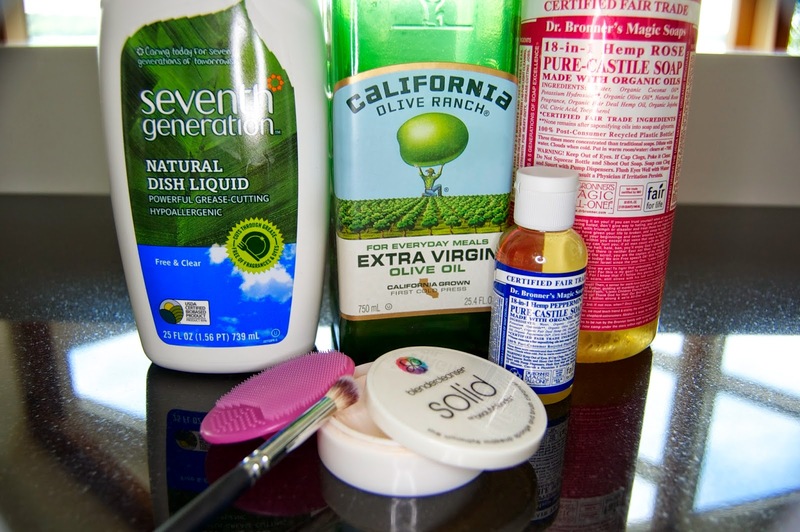 I use about 4 parts dish soap to 1 part olive oil on a plate, then swirl my brushes through both before rubbing it around against a scrubber or my hand and then rinsing. Certain synthetic brushes, mainly duo-fiber or very dense kabukis tend to grab hold of the oil and can feel a little slimy so use minimal oil on those bad boys and keep it in mind if they feel strange once they're dry. Dr Bronners Castile Liquid Soap (X)- If, for some reason you're not keen on this option, these soaps are great, my only concern is they might not be as conditioning as the olive oil combo but i could be wrong. I'd say this is a better option for personal brushes opposed to using on brushes in your kit for the makeup artists out there. Target now carry mini Dr Bronners soaps which are perfect for travel! Beauty Blender Solid Cleanser (X)- Lastly there are brush cleaning cakes, yes.. cakes. The Beauty Blender solid is a great option for a deep clean while traveling, just make sure you rinse the cake after use and leave it out to dry. I got mine in the Beauty Blender Airport Kit which comes with a sponge, solid cleanser and breathable travel case. 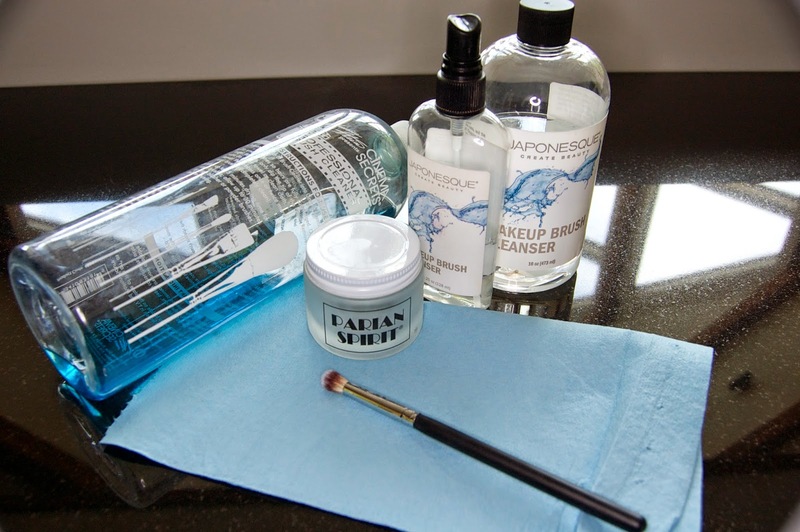 You might be perfectly okay with just a good cleanser but if you take your brush cleaning very seriously, here are some great extras you might want to look into. Drying helpers- because its so important to stop your brushes from getting water or cleanser in the ferrule, i like to use a drying rack to eliminate this issue. Benjabelle Brush Tree (X)- these come in multiple different sizes and are pretty much my new favorite thing. They securely hold your brushes and make drying a breeze... get it? Drying? Breeze? Anyway, they're easy to dismantle so are perfect for home or travel. Sigma Dry 'n' Shape (X)- this is pretty much a soft version of the Benjabelle tree. My only issue with this one is i feel that the elastic which covers the hairs might not be breathable enough so i like to let my brushes dry a little before putting them in here to reshape them. A couple of nice things about this is that it does reshape them well and if you're in a rush you can grab them and go as it closes back up like a brush roll. Brush Guard (X)- brush guards are like my old faithful friend, they might not hold your brushes up but they certainly reshape them well. You could use these in conjunction with the Benjabelle tree for optimal drying and reshaping. I leave these on clean brushes i'm putting away so i know they're clean and ready to use when i reach for them again. Scrubbies- i wasn't sure what else to call these so perhaps i'll just show you. Sigma Spa Brush Cleaning Glove (X)- essentially this is a repurposed silicone oven mitt but damn, did they do a good job! Wear this on your non- dominant hand while cleaning your brushes for all the texturized nubbies you could ever need to help you get a deep clean. They now even have a double-thumbed option. 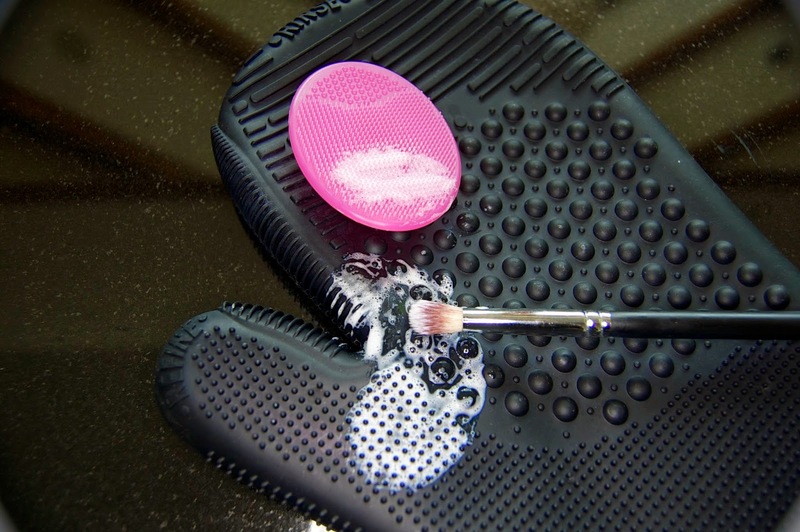 Sephora Pore Cleansing Pad (X)- you've probably seen these at sephora a billion times but they double up well as a brush cleaning tool and are a little easier to cram into your makeup bag than the glove. Before deep cleaning brushes always make sure the sink and surrounding area is clean and free of bacteria. ALWAYS hold your brushes at a downwards angle when holding them under the tap, do not let that water wash up into the ferrule, you can hold them just past 90 degrees if you need to get deep into the hairs to rinse. Check kabukis and brushes that harbor makeup deep inside after you've washed them, if there is still residue, don't be lazy and wash them again til they're clean! To dry brushes properly without equipment you can roll up a clean tea towel or towel so the brush handle is elevated while drying. I lay shop towel over the tea towel to avoid lint. If your brushes start to shed a lot when you wash them, its probably time to throw them away, this means the adhesive inside the ferrule is starting to break down. If your handle comes loose from your brush when washing, let all parts dry thoroughly then CAREFULLY use super glue to reattach the handle later. Lastly, brush cleaning can be either really therapeutic or really annoying (similar to doing laundry in that respect) so i make it as easy as possible by staying organized. Pick a day to be your brush cleaning day and try and stick to it. Also keep your cleaning products and accoutrement organized so you can grab them and head straight for the sink.